Eating this tonight took me back to Spain. My husband said the same thing when he sat down for dinner. It's amazing how a simple dish can bring back so many great memories. I remember exactly where I had my first authentic Paella--in a small outdoor cafe located in an alleyway in Sevilla, Spain. And eating this tonight brought it all back--the earthy aromas of the saffron, the vibrant golden color of the rice and the caramelizing on the bottom of the pan, creating what is called the socarrat. The only thing missing from this perfect meal was a chilled glass of Albarino! Note: My paella pan is 10" and is perfect for 2-4 people depending on how hungry everyone is. Allow 1/2 uncooked rice per person. I used 1 1/4 cups and it was perfect for the size of my pan. 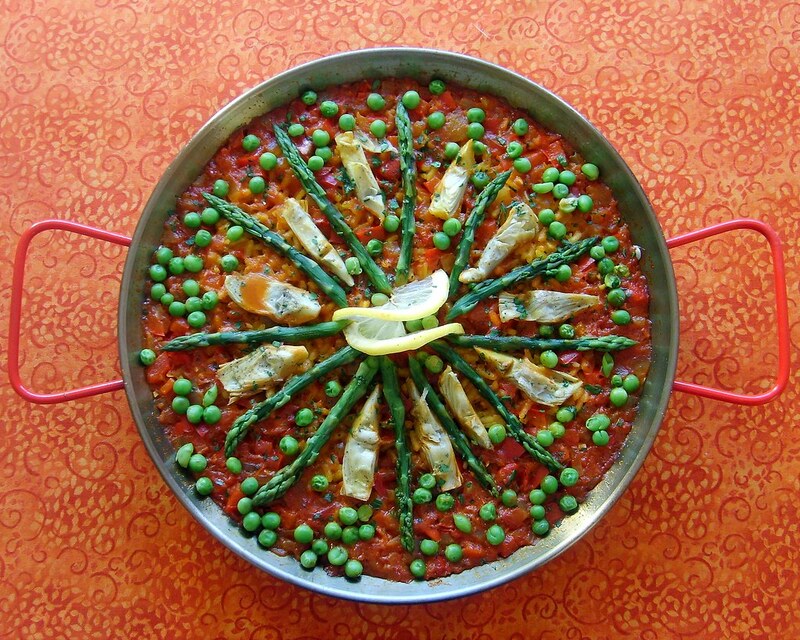 I purchased my Paella Pan at The Spanish Table (I love this store!) in Berkeley. Bring three cups vegetable broth to a simmer and add 1/2 tsp crumbled saffron threads. Remove from heat and let steep while you prep the other ingredients. Dice onion, bell pepper and garlic and set aside. Cut asparagus tips to desired length and steam for about 2 minutes until slightly cooked, but still have texture. Heat the paella pan on medium-low heat, add 1 tbsp olive oil, add onion and bell pepper and cook until soft. Add garlic and cook for 2-3 minutes more. Add 1/2 tbsp olive oil to the pan and stir in rice, mixing well with the peppers and onions. Add the pimenton and tomato puree and stir again. Slowly pour in broth until it reaches 1/4"-1/8" from the top of the pan and mix ingredients well. Reserve any left over broth. Bring rice to a boil and reduce to a low simmer and cook until almost all liquid is absorbed, about 20-25 minutes Taste a piece of rice--it should be soft on the outside, but retain a slight bite in the center. You may need to add more liquid if it looks too dry. About 2-3 minutes before the rice is finished cooking, add asparagus, artichokes and peas and then turn off heat and let the paella sit for 10 minutes for all the liquid to absorb. Finish with a squeeze of fresh lemon juice and garnish with parsley. And don't forget the wine! Enjoy! Going Vegan--The Best Decision I've Ever Made!